While the English often name their houses, here in the United States, we typically do so only for our seasonal cottages. The roads of Northern Michigan are dotted with endearing cottage names painted and carved into roadside signs. Some signs seem homemade; others look professionally produced. Some are simple; others have elaborate scenic images and distinct fonts. Some may refer to a family name, the setting, the structure itself, values, or preferences; a few declare that this is paradise. I recently became curious about patterns in cottage names, having noticed many that name “paradise” and proclaim the perfection of lake life. I guessed that these were typical—it turns out I was wrong. The reality is more interesting. While biking around Crystal Lake, both Platte lakes, and both Glen lakes over several summers, I photographed more than 200 cottage name signs. I was interested in both the cottage names and the imagery of their signs (mostly roadside signs), and I looked for clues to family traditions and interests. A sampling of signs for cottages. Photos courtesy of Beau Vallance. In my career, I taught teachers how to use art in teaching, and name signs communicate directly by using various simple visual styles. I started wondering about the categories that the names fell into, and I found several; some names even fell into multiple categories. Here are some examples, but be on the lookout yourselves, as they can surprise you. (Some resort names may not always be obvious). Fewer than 10 percent of the cottage names I saw proclaim perfection: Elysium is a prime example, so are Blue Heaven, Delighthouse, Land of Ahhhs, Paradise Too!, Glen Heaven, Unger’s Utopia, Shingri-La (playing with a last name), and—now gone—the mixed message of Paradise on one side and Pandemonium on the other. I was surprised by this low count of only 10 percent. Although we talk about our Up North places as idyllic escapes from everyday life, we name them mostly with simple descriptions. We let those characterizations speak for themselves. Most cottage names simply allude to what is visible—the setting, the house itself, the view, or weather features. More than half fall into this “descriptive” category. Thus, we have Leafy Dell, Tall Timbers, Cedar Shores, Edgewater North, Sandy Shores, Birch Grove, The Hilltop House, The M-22 House, and “On The Rocks” (in quotes, surely a double-entendre), as names describing the setting. Actual houses and their features appear in names such as Shinglewood, The Cottage, Pinecot, Grey Logs (with matching mailbox), Gray Gables (matching mailbox), and CedarCot. Weather conditions and view are proclaimed in Blue View Too, Windswept, Sailview, Windridge, Water Colors, Crystal Clear, True Blu,e and The Blue Line. There is a strong theme of comfortable settlement and ownership, with about 20 percent using names such as Our Particular Harbor, B’s Nest, Nesting Place (now gone), Our House, Aunt Margaret’s, and The Roost. Additionally, a noticeable thread of personal enthusiasms/loyalty/identity is apparent, as in Maize and Blue Shores, Hoosier Hideaway, Hoosier Glen, The Cat’s Meow, or just a family name like “Stow” that is painted on a fish-shaped board. True Blue, featuring a very blue Glen Lake, might also be University of Michigan alums. The Ahhhs people could be from Kansas. 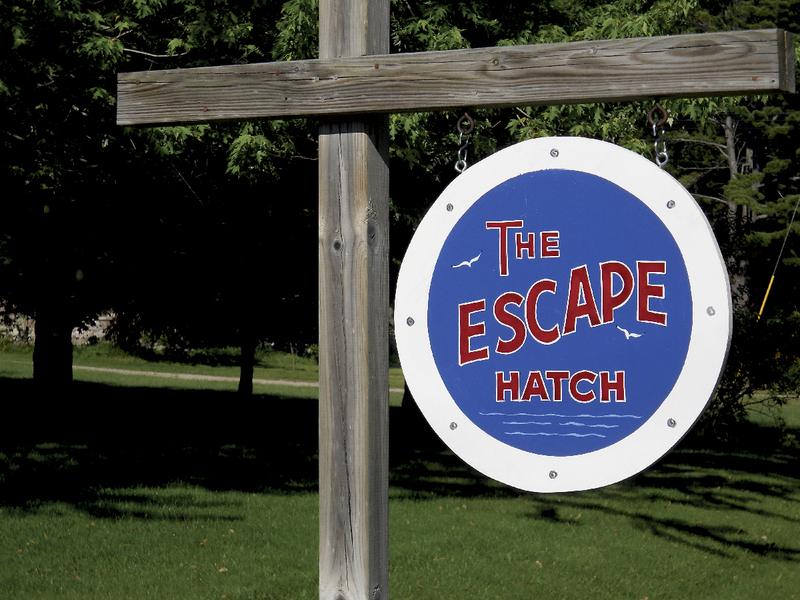 Equally strong—no surprise—is a theme of escape, refuge or protection: Northern Escape, Snug Harbour, Woody’s Time Out Retreat, Second Wind, Boone’s Time Out, Dry Dock, The Sweet Escape, The Escape Hatch, as well as many havens and harbors. This “refuge” theme is clear. Puns and wordplay appear: Boot Camp (depicting hiking boots, not military), Dune Good (laidback Adirondack chairs facing the lake), Been There Dune That. But more frequent are plays on family names, like Payne’s Staking, The Wright Place, Herendune, Blenman’s Bluff, JenLake, B’s Nest, Faye’s II, Shingri-La, MacIntosh (on a big red apple), and Roman Empire, near Empire. Some fun but small categories, with only a few examples, are: second home (Second Wind, Fay’s II, Windswept Too!, Branch Office), literary and historical references (On Waldie’s Pond, Narnia, 10 Downing Street), goal achieved (This Is It, Finally, and—good one for the Old Mission Peninsula—Mission Accomplished). A few use the family name to create a welcoming message (Sadow’s Do Duck Inn, Bob’s All Day Buffet, Walke Inn, Wade Inn). Only Empty Pockets seems to hint (and with humor) at the cost involved. As interesting as the wordplay of names is the range of visuals illustrating them. More than half of the cottage name signs include images of some kind. There’s a wide range, from elaborate depictions of the setting, house, or lake view to stylized trees, boats, and water. The most elaborate images are full landscape compositions (some gorgeous lake views, as in houses named Water Colors, Willow Point, and Hilltop House). Others are simple abbreviated references to boats, oars, fish, those boots, and empty pockets. 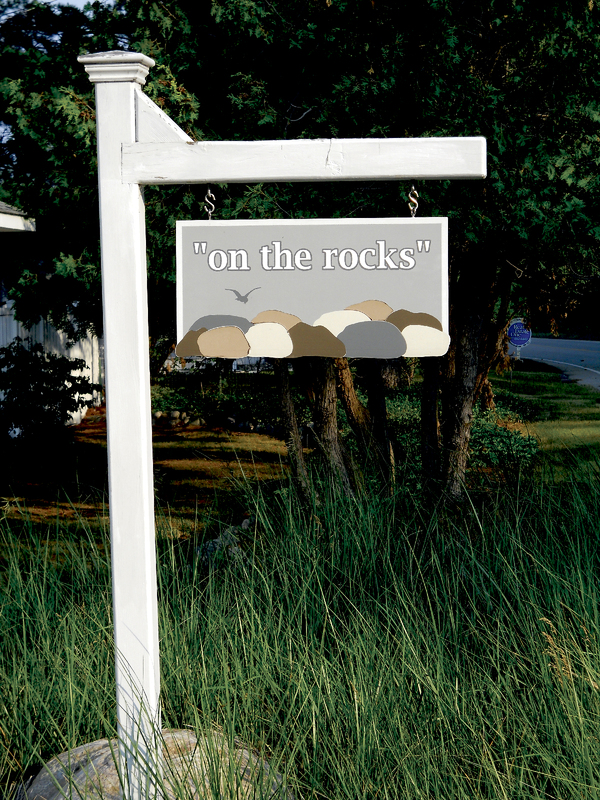 I estimated fewer than 20 percent of the signs to be homemade—most cottage-name signs, if they provide more than just the family name, look professionally made, with careful craftsmanship in design, carving, lettering, and paint quality. Of course, most houses— even in this land of second-home refuges—are not named, and they function just fine with only a family name and a mailbox. Often it’s the mailbox that signals identity, as does Clan MacArthur’s tartan mailbox. 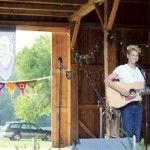 Decorative mailboxes alone, though, mostly convey enthusiasms, such as fish, tractors, vintage cars, flip-flops, lighthouses, birds, etc., and rarely feature cottage names—Crystal Chambers (with judge wig) is an exception. Most mailboxes are just mailboxes. And some signs mentioned here are already gone; the cottage sold and the story changed. But many Up North places do have names, and they seem to be entirely upbeat—cheerful, witty, occasionally ironic, and enthusiastic about local resources. 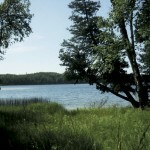 They celebrate the lakes, trees, dunes, the chance to relax among all of this, and a sense of escape from something else. Our cottage names, taken together, describe a place where we love to be—not necessarily paradise, but a very good place. I wonder how we would name our real houses, if we did. 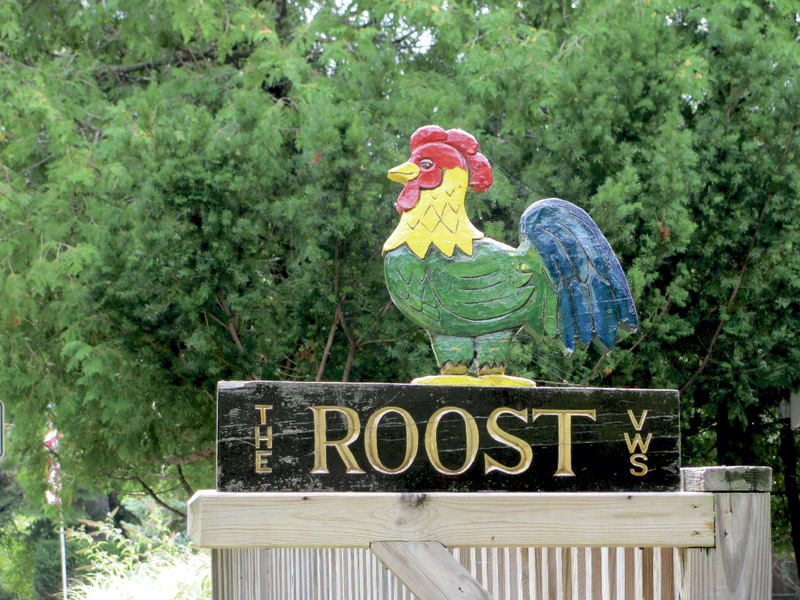 Feature photo: A hand-made cottage sign shows that this cottage has some charm, or the residents get up way too early. Photo courtesy of Beau Vallance.